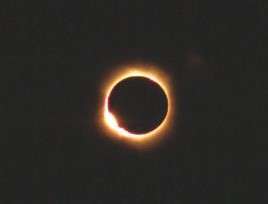 Mimnermus was one of several ancient, Greek poets who composed verses about solar eclipses, and there was a total solar eclipse of his home town, Smyrna, on April 6, 648 BC His poetry survives only as a few fragments yet they afford us a glimpse of his "brilliantly vivid" style. Mimnermus (Greek: Μίμνερμος Mímnermos) was a Greek elegiac poet from either Colophon or Smyrna in Ionia, who flourished about 630–600 BC. He was strongly influenced by the example of Homer yet he wrote short poems suitable for performance at drinking parties and was remembered by ancient authorities chiefly as a love poet. Mimnermus in turn exerted a strong influence on Hellenistic poets such as Callimachus and thus also on Roman poets such as Propertius, who even preferred him to Homer for his eloquence on love themes (see Comments by other poets below). His work was collected by Alexandrian scholars in just two "books" (relatively few compared for example with the twenty-six books for Stesichorus) and today only small fragments survive. The fragments confirm the ancient estimate of him as a "consummate poet" but also indicate that he was a "sturdier character" than the indulgent love poet he was assumed to be by various ancient commentators. Almost no reliable, biographical details have been recorded. One ancient account linked him romantically with a flute girl who subsequently gave her name, Nanno, to one of his two books. Mimnermus, son of Ligyrtyades, from Colophon or Smyrna or Astypalaea, an elegiac poet. He flourished in the 37th Olympiad (632–29 BC) and so is earlier than the seven sages, although some say that he was their contemporary. He was also called Ligyaistades because of his harmonious clarity. He wrote ... books. Would that my fated death might come at sixty, unattended by sickness and grievous cares. Solon thought he should be willing to live to eighty. Plutarch was another ancient author critical of the poet's self-indulgence, dismissing one poem (see Fragment 1 in Poetic style below) as "the utterances of intemperate people." Mimnermus however was not timid in his hedonism, as indicated by a couplet attributed to him in the Palatine Anthology, an exhortation to others to live intemperately: "Enjoy yourself. Some of the harsh citizens will speak ill of you, some better.". However, the same lines have also been attributed to Theognis. A robust side to his personality is shown by his versatility as a poet. Archaic elegy was often used for patriotic purposes, to screw courage to the sticking place in times of war and to celebrate national achievements, and there is ample evidence that Mimnermus assumed this role as a poet. A quote recorded by the geographer Strabo represents the earliest surviving account of the Ionian migration, celebrating the settlement of Colophon and Smyrna from Pylos,  while another quote, recorded by Stobaeus, describes the heroic exploits of a Greek warrior against the cavalry of the Lydian king, Gyges, early in the 7th century—Mimnermus evidently hoped thereby to strengthen his countrymen's resolve against further Lydian encroachments. The name "Mimnermus" might have been chosen by his parents to commemorate a famous Smyrnean victory against Gyges near the Hermus river (and yet names ending in -ermus were quite common in Ionia). He was alive when Smyrna was besieged for the final time by the Lydians under Alyattes II and possibly he died with the town. The disappearance of Smyrna for the next three hundred years might be the reason why Colophon was able to claim the poet as one of its own, yet Smyrna's own claim persisted and this suggests that its claim had the advantage of being true. Smyrna lay near Mount Sipylos, one of whose rocky outcrops was traditionally imagined to be the tragic figure Niobe. Like other archaic poets, Mimnermus adapted myths to his own artistic needs and Aelian recorded that he attributed twenty children to Niobe, unlike Homer, for example, who attributed twelve to her. According to Sallustius, Mimnermus was just as creative in his poetical account of Ismene, representing her as being killed by Tydeus at the command of the goddess, Athena, in the very act of making love to Theoclymenus—an original account that was soon accepted by an international audience, being represented on an early Corinthian amphora (pictured below). Imaginative accounts of the sun, voyaging at night from west to east in a golden bed, and of Jason the Argonaut voyaging to "Aeetes' city, where the rays of the swift Sun lie in a golden storeroom at the edge of Oceanus", survive in brief quotes by ancient authors. 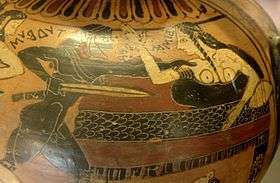 According to Strabo, Smyrna was named after an Amazon and, according to a manuscript on proverbs, Mimnermus once composed on the theme of the proverb "A lame man makes the best lover", illustrating the Amazonian practice of maiming their men. Unlike epic and lyric verse, which were accompanied by stringed instruments (the cithara and barbiton respectively), elegy was accompanied by a wind instrument (the aulos) and its performance therefore required at least two people—one to sing and one to play. 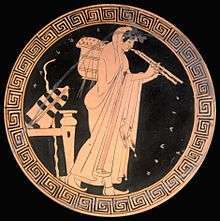 Ancient accounts associate Mimnermus with a female aulos player, Nanno, and one makes him her lover (see quote from Hermesianax in Comments by other poets below). Another ancient source indicates that Mimnermus was a pederast, which is consistent with conventional sexual themes in Greek elegy. However, as noted by Martin Litchfield West, Mimnermus could have been a pederast and yet still have composed elegies about his love for Nanno: "Greek pederasty ... was for the most part a substitute for heterosexual love, free contacts between the sexes being restricted by society." Mimnermus apparently was also capable of playing all by himself—Strabo described him as "both a pipe-player and an elegiac poet". According to the poet Hipponax, Mimnermus when piping used the melancholy "fig-branch strain," apparently a traditional melody played while scapegoats were ritually driven from town, whipped with fig branches. 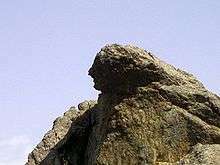 Weeping Stone, Mount Sipylos—associated with the tragic figure of Niobe. Ancient commentators sometimes refer to a work called Nanno and there is one clear reference to a work called Smyrneis. Modern scholars have concluded that these could be the two books mentioned by Porphyrion. The Nanno appears to have been a collection of short poems on a variety of themes (not just love), whereas the Smyrneis appears to have been a quasi-epic about Smyrna's confrontation with the Lydians. A cryptic comment by the Hellenistic poet Callimachus (see Comments by other poets below) also seems to refer to those two books, commending one for "sweetness" and distinguishing it from "the great lady". The latter seems to be a reference to Smyrneis, whereas the sweet verses—apparently the slender, economical kind of verses on which Callimachus modelled his own poetry—appear to refer to Nanno. However, the comment is preserved as an incomplete fragment and modern scholars are not unanimous in their interpretation of it. Another Callimachus fragment has been interpreted as proof that Mimnermus composed some iambic verse but this conjecture has also been disputed. Elegy has been described as "a variation upon the heroic hexameter, in the direction of lyric poetry," and, in Mimnermus, this takes the form of a variation on Homer, as appears for example in Fragment 1, quoted below, about which one modern scholar had this to say"
Mimnermus' dependence on Homer is striking: it is amusing to see him express such un-Homeric thoughts as those of fr.1 in language which is almost entirely Homer's. Homer's vocabulary, line-endings, formulas, similes, all reappear, but from this material Mimnermus creates quite a distinctive poetry of easy grace and pleasing rhythm. May my fated death come at eighty. In love the verses of Mimnermus prevail over those of Homer. Gentle love calls for soft songs. There is no joy, may you live amid love and jests.